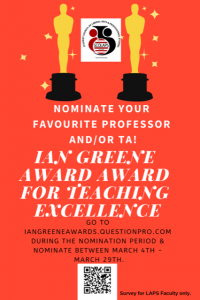 The Ian Greene Award for Teaching Excellence is an annual merit-based award given to one professor and one teaching assistant from the Faculty of Liberal Arts and Professional Studies (LA&PS). The award is an opportunity to recognize the and reward faculty who have demonstrated excellent ability in teaching and supporting their students. It is named after School of Public Policy and Administration professor Ian Greene. The award was created by his former students in recognition of his outstanding drive and effort to teach and make learning a unique experience. All LA&PS students are eligible to nominate ONE professor and ONE TA of their choice. Students do NOT have to nominate professors and/or TAs that taught them in the same academic year the award is being given in, but they do have to be current, practicing faculty. Enter for a chance to win a gift-card! The standing Ian Greene Director will form an adjudication committee consisting of 5 LA&PS students (not serving in the Executive/Director team) to review all the nominations submitted after the nomination period. After thorough deliberation among the committee members, the winners will be selected. When evaluating potential recipients, the members will not just consider the number of nominations a given nominee receives, but also the quality of feedback students leave for them. If you are a LA&PS student and are interested in sitting on this committee, please email hammna97@my.yorku.ca before the deadline. This committee is selected on a first-come-first-serve basis.